On July 4, 1771, the new plantation called Number Two was established as Partridgefield. Then, on March 12, 1783, a part of Partridgefield was included in the new town of Middlefield. On June 21, 1804, a part of Partridgefield was established as Hinsdale. And finally, on June 19, 1806, the name of Partridgefield changed to Peru. Hinsdale is a farming town of varied and beautiful scenery in the eastern half of the middle section of Berkshire County, 143 miles west of Boston by the Boston and Albany Railroad, which runs through the midst of the town from the southeast. The station, post-office and village are a little north of the centre of the town. Its boundaries are Dalton and Windsor on the north, Peru on the east, Washington on the south, and the latter and Dalton on the west. The assessed area is 13,745 acres; and of this 3,606 acres are forest, consisting of maple, beech, birch, spruce and hemlock. The town is elevated, generally level, with hills about its borders, from which gather the brooks, forming near the centre a large stream that furnishes motive power sufficient for several mills. Near the centre is Ashmun Pond, containing some 400 acres, fed by two small brooks and a mineral spring at the west of it. Brown iron ore, and the minerals apatite and zoisite, are found in the town. The soil is loamy, and quite fertile. Sheep are not kept to such an extent as formerly, but are still more numerous than the average. Large quantities of maple sugar are annually made here. The aggregate product of the 107 farms in this town in 1885 was valued at $104,737. There were formerly cotton mills here, but now the chief manufacture is woollen cloths. The principal mill is constructed of stone. In 1885 it made goods to the value of $385,369. Boots and shoes, carriages, leather, metallic goods, lumber, furniture and food preparations are manufactured here to some extent. The aggregate value of goods made in the last census year was $456,039. The valuation in 1888 was $712,784; with a tax rate of $16.40 on $1,000. The number of dwellings is 270; of inhabitants, 1,656; of legal voters, 314. The town has a good hall, and a public library building valued at $16,000, and containing nearly 4,000 volumes. The schools are graded, and occupy seven buildings valued at about $11,000. The Congregationalists, the Baptists and the Roman Catholics each have a church here. 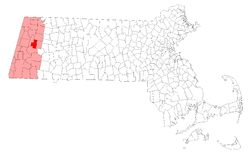 This town was settled as early as 1762; and among its founders were Francis Miller and brothers David and Thomas, the Torrey brothers from Rhode Island, and Joseph Watkins and his five sons from Hopkinton, Massachusetts. In 1771, Nathan Fisk built the first saw and grist mill here, for which he received a bounty of 250 acres of land. A church was organized December 17, 1795, and the Rev. Theodore Hinsdale elected pastor. In 1797, a Baptist church was formed. Partridgefield (now extinct) formerly included this place, which was separated and incorporated as a town June 21, 1804. It was named in honor of its first pastor. Hinsdale sent 150 men into the Union armies during the war of the Rebellion, and 12 of these (its own citizens) lost their lives in the service. 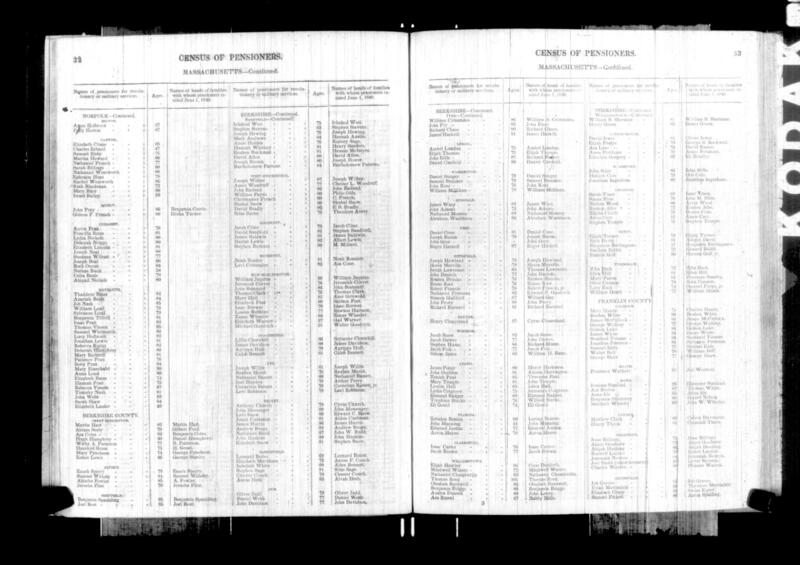 This census is listed under a former name of Hinsdale - Partridgefield. 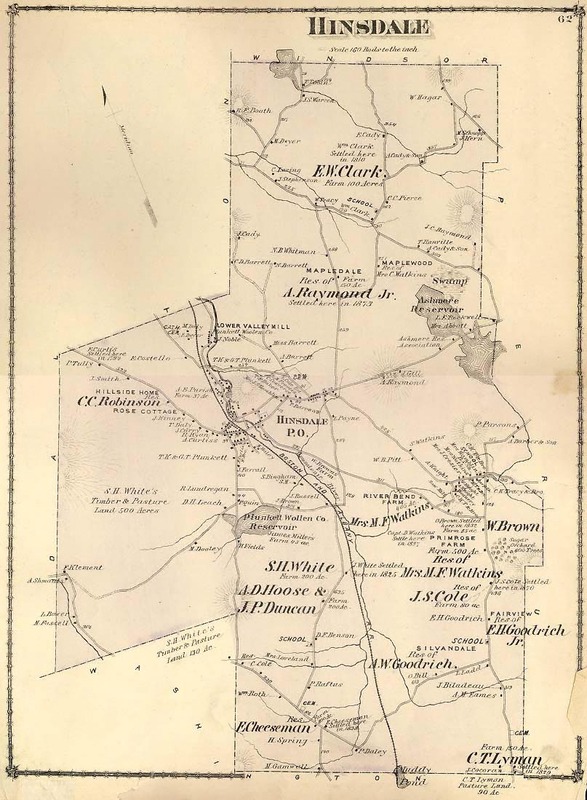 from "County Atlas of Berkshire, Massachusetts. From actual survey by and under the Direction of F. W. Beers, Published by R. T. White & Co., 36 Vesey Street, New York, 1876." Some maps have names of residents. Please submit any Hinsdale related photos for posting! © Copyrighted from 1995 to present for the benefit of the Massachusetts GenWeb Project.